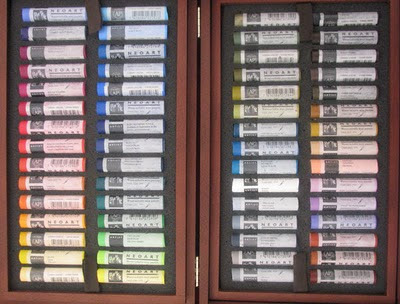 I came across Caran d'Ache NEOART Aquarelle Pastels for the first time at Patchings recently. Always a sucker for a big wooden box full of juicy colours I took a photo! ...and then started to try and find out a bit more about them to see if they're likely to be something I want to investigate further. (I've got to that point where any new product needs to earn its place in my home). 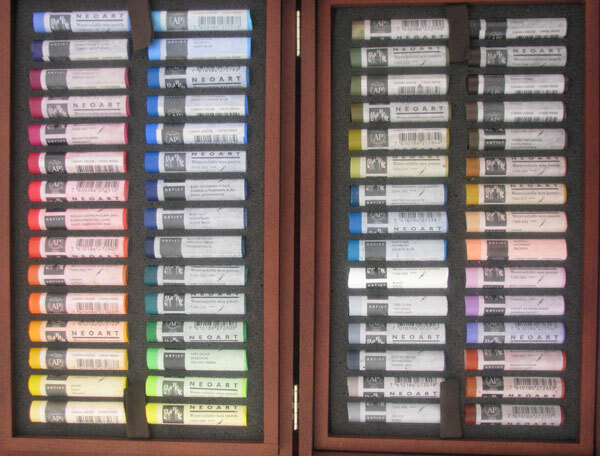 I particularly wanted to know what was the difference between these bigger NEOART pastels and the smaller Neocolour II pastels. Do they work in the same way? What, if any, are the differences? A big difference to the artist between the two is the size and hardness. The Neoart pastels are harder and seem a bit waxier than the neocolors. Since they come in a large size, they are a bit more awkward to hold in the hand, and the ends are blunt, not sharpened, so control can be a bit more difficult to achieve with them. After everything was dry I started coloring with the wax pastels. I smooshed them around with my fingers and rubbed them with an old rag. Then I grabbed the first sharp object I found on my art table (a needle I use for bookbinding) and I began to scratch into the pastels. And oh how I loved the effect I was able to achieve! 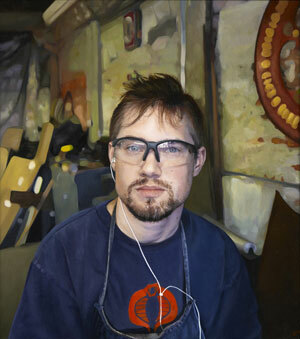 David Eichenberg likes to paint portraits which are based on the pictoral qualities of historical paintings. However he used a very modern support made of pvc on which to paint - called Sintra. It strikes me that there are others like me that have never heard of it before - hence this post! David told me that it is completely inert and very rigid and consequently will last a very long time. It's also very lightweight so could be a very sensible option when sending paintings overseas as David had to do when sending the portrait on the right from Toledo, Ohio to London. It struck me that it might possible be a very sensible option for daily painters who have lots of overseas customers - so I decided to do some more research. After talking with him last week, I went away and found the website http://www.sintrapvc.com/ . Sintra PVC Foam Board is available in 1mm, 2mm, 3mm, 4mm, 5,mm, 6mm and 13 mm. It can be suctom cut to any size but comes in stock sheets of 1Mx8, 4'x8', 4'x10', 5'x10', 2Mx 10'. I'm guessing that David has found out all about its properties because he majored in sculture while doing his degree - and sculptors tend to know an awful lot about how materials work and whether or not they deform over time. David coats the Sintra he uses with acrylic gesso before painting on it using oil paints. However, from what I could see others had experienced problems and the trick seems to be to find something which provides the first coat and which then allows other paints to be used on top. I wrote to David about this post and he sent me the method he uses. Step 1: I rough up the surface with 220 grit sand paper to remove the semi-gloss finish and to give the Sintra a little tooth to help with the gesso adheision. Step 2: Apply gesso, I use Liquitex Professional Gesso, I find that this is pretty close to the working properties that one might find with traditional gesso. When set it is absorbant which is how I prefer my base. The student gesso is non-absorbant and the paint seems to just push around on it. Step 3: Apply 2-3 coats of gesso and let dry overnight. Step 4: sand with 220 lightly then move to 320 or 400 grit, depending on what type of surface you prefer. I use the 6mm board. The 3mm board will warp from the gesso pulling as it dries on one side. Any warping that does happen is minimal and can be corrected by framing. The spring is less than that of wooden panel. I have had paintings done using this method in my studio, which is not climate controlled and sees extreme temperature and humidity chages throughout the year with no integrity issues, whatsoever. There is a manual which is mentioned by some as the best reference for working with Sintra - I think this is the pdf file for the Sintra Manual created by Alcan Composites. With Sintra material, water-based latex systems and oil-based enamels generally do not have the good adherence properties of solvent based systems. Although, the use of primers can improve the adherence of non-solvent based systems, the adherence is usually minimal. It also indicates the preparation required prior to painting. The Manual also recommends testing. Iron Man Armor (Sintra) !WIP! In terms of supplies, I'm guessing we're talking about specialist suppliers only. Foamboardsource.com is one source of Sintra that I found on the net and David confirms this is the one he uses. Many thanks to David for providing notes on how he uses Sintra - that's helped to clarify how it's used and I have to say David's oil paintings look extremely good on it. Note: David Eichenberg lives in Toldeo, Ohio and graduated from the University of Toledo with a degree in sculpture and painting in 1998. Finalist in the Outwin Boochever Portrait Competition 2009 at the Smithsonian Museum. 3rd prize in the BP Portrait Awards at the National Portrait Gallery in London (June 2010). The landscape of New Mexico is just a strong motif in Georgia O'Keeffe's work as her popular flowers. This book explores the locations she painted in and analyses her approach to her landscape work in New Mexico. It provides insight into both the character of the place, the painter and the person. I love books which compare the place 'as is' with the paintings produced by an artist. I'm also a huge fan of geomorphology and geology so any artist who enjoys landforms always catches my eye. When they are as accomplished a painter as Georgia O'Keeffe, it would be fair to say I was 'sold' on this book as an idea from the off! 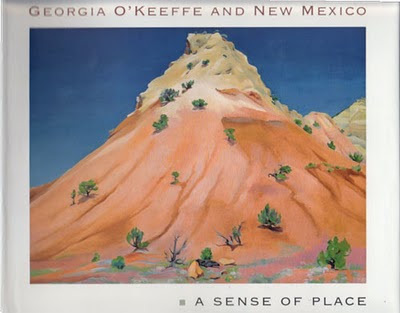 Georgia O'Keeffe and New Mexico: A Sense of Place by: Barbara Buhler Lynes, Lesley Poling-Kempes, Frederick W. Turner delivered to my expectations and more. This exhibition catalogue is a really marvellous example of the homework that went into the 2004 exhibition of O'Keeffe's painting of New Mexico at the Georgia O'Keeffe Museum in Santa Fe - Georgia O'Keeffe and New Mexico: A Sense of Place. I'd have loved to have seen this exhibition but unfortunately paid my visit to the Museum some two years later in 2006. It's extremely well researched and makes the experience of looking at the paintings that much more rewarding. The locations were tracked down and photographs were taken of the current geology - at which you point you begin to realise how faithful her paintings are to the contour and how wonderfully she extracts and simplifies to produce her wonderful paintings of New Mexico. The book also includes three essays by people covering different aspects of her life and work. All of them bring to life the experience of the environment both as a stimuli and as a context for O'Keeffe's paintings. Barbara Buhler Lynes, Curator of the Georgia O'Keeffe Museum and organizer of the exhibition, discusses the relationship of the artist's paintings to the places that inspired her and how she reduced and simplified forms to abstract the essence of the place while retaining its inherent beauty. The juxtaposition of photos and paintings is simply stunning. Lesley Poling-Kempes provides a chronology of her years in New Mexico. She also explains the geology and why there are such intense colours and dramatic shapes within the landscape. As an amateur geologist I found the explanation of the 225 million years of geology in the layers of rocks in the mountains at the back of Ghost Ranch to be absolutely fascinating. Her explanations of what produced the warm and cool colours will interest anybody who likes to understand the formation of a landscape. O'Keeffe's style was like walking out on a rocky ledge, I thought, with no room for misstep: either she would estblish dominion or she'd be defeated and the paintings would be botches in which viewers wouldn't be able to sense what she'd dared.....and whatever your ultimate judgement of O'Keeffe's work work might be, there could be no cailing with the profound sincerity of her engagement, here, the danger of it. For her this had been no playground. I'm extremely pleased to hear that, after a very long delay, Harper Collins have decided to reprint The Art of Botanical Painting. This book was written by Margaret Stevens, the Immediate Past President of the Society of Botanical Artists, in association with the Society - many of whose artists contributed botanical artwork for the book. Consequently, it's excellent at showing you the standard of work required to become a member. 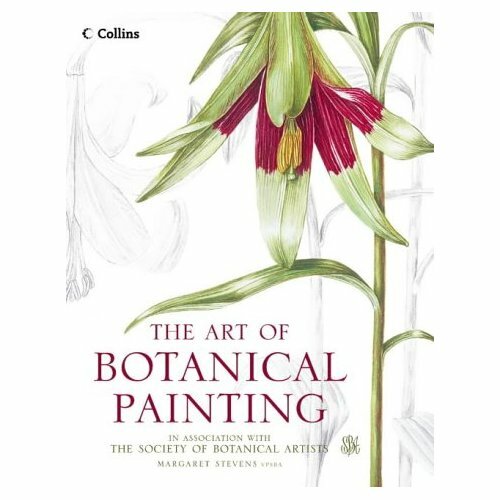 Margaret is also the Course Director of the Distance Learning Diploma Course in Botanical Art run by the Society of Botanical Painting - for which this book is a core set text. I t's been very difficult if not impossible to get hold of a brand new copy for quite some time. Students wishing to do the course have had to buy second hand but even second hand copies are now proving difficult to find. For those wishing to do the Diploma, I very much recommend that you buy a copy as soon as they become available which I understand will be August. I visited Patchings Art Festival for the first time yesterday. It's based in the fields behind the Patchings Art Centre just outside Nottingham and hence is much better located than London for amateur artists wanting to buy art materials and see demonstrations. The Patchings Festival is celebrating its 17th year this year and has so far survived the recession. It's also survived whatever caused the demise of a very similar festival which I used to go to a lot which the Artists and Illustrators Magazine ran for many years at the Business Design Centre in Islington. Patchings is not as big as that event used to be - but that said it still provides for a jolly good day out for members of an art society. I went with Vivien Blackburn (Paintings, Prints and Stuff) and we didn't get anywhere near getting round the whole show. (I should mention this was partly because Vivien kept meeting ex-students and fellow art teachers who she knew!). However over a cup of tea sat outside in the sun we cogitated over what we thought of the festival. 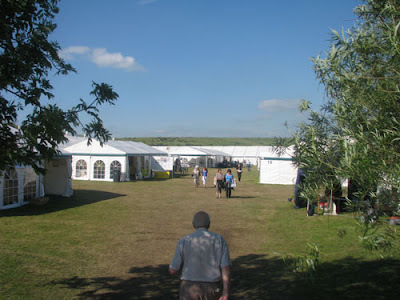 Click the links to see who was exhibiting in which tent. Good selection of art materials - somewhat unexciting but some bargains to be had. Materials very much oriented towards painting and works on paper. It seemed to me that the watercolour, acrylic and pastel artist was well catered for. 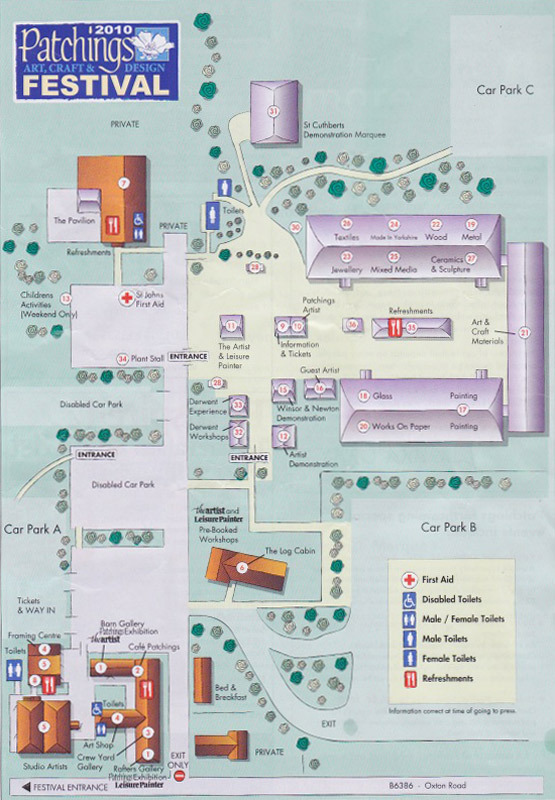 Parking is included in the price of ticket and there's lots of space for cars to park - which means you can fill your boot if you want to! The Festival is relatively easy to find and is not on a busy road so doesn't produce some of the snarl ups which can be experienced at other places when everybody tries to exit at the end of the day! Refreshments tent on site - OK (unexciting) but not as expensive as some exhibition centres. Plenty of seats for people to sit down. We also saw people picnicking in the nearby car park. The stands are all in marquees set out in fields behind the Centre buildings. Great if it's summer and all is dry but I'd guess it might be less nice if the weather wasn't very good. The temperature inside the marquees was rather high and whereas we could take a break outside, there was little respite for exhibitors. I suspect if the weather was wet or cold it might have felt a very different experience - but such is the lot of anybody exhibiting in a marquee at any outside event. Those offering tuition seemed to be split between painters offering courses (in the painting tent) and artists offering tuition in booklet or video format (in the art materials tent. Those offering tuition appeared much more impressive when present in person and actually able to demonstrate what they were did and how they did it. I noted however a few artists who weren't demonstrating at all on their own stands. There's always a balance to be struck between looking competent, appearing approachable - mostly to do with how people sited themselves relative to the visitor - and running the stand and keeping an eye on the stock. 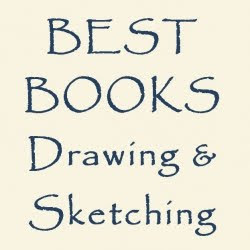 It's worth checking out the categories as to which is the best to list in. My friend Gayle Mason (Fur in the Paint) (see her stand in the photo) works in mixed media (coloured pencils, pastels and acrylic) on paper and listed under mixed media but moved tents so she was in with the painters. It's worth remembering that while many people come to Fesivals like this to see and to learn, many have also come prepared to spend money! However many also have to carry their purchases home with them. In my view, for those not in cars, this is a marketplace for high volume sales of items which don't break the bank and are easy to carry. Small, lightweight and inexpensive iterms (eg fine art prints and cards by artists, calendars and small originals) appeared to me to be much more likely to be popular than heavy weight large items such as orginal artwork in frames. 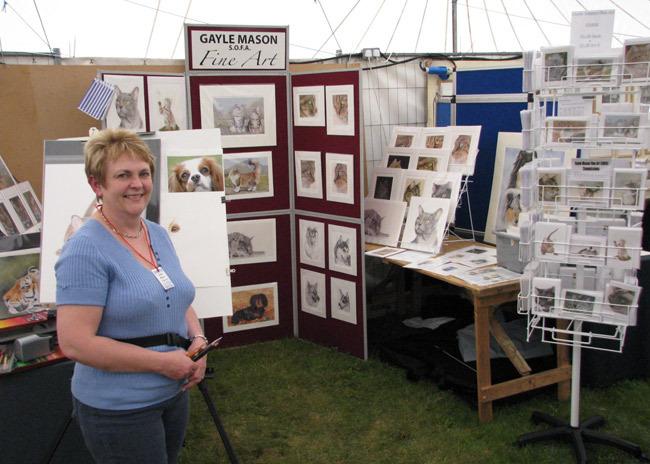 Gayle also confirmed that her step by step tutorial pack on creating an animal's was proving to be very popular and a number of people were taking her very nice and informative leaflet about commissions. Many of those who attend are very interested in attending demonstrations and hence are more likely candidates for additional formats for learning about art. The Festival is good for soliciting interest from hobby artists in different forms of art education - videos, booklets, holidays, courses and workshops. a good range of categories for arts and crafts oriented exhibitors with significant numbers of good quality exhibitors in each. It provides a good mix for the visitor. I wouldn't want to be trying to move stock across the field if there has been a lot of rain and the ground is sodden! For the record I came away with two small wooden apples in Spanish Olive and Tulip Wood (for my wooden fruit collection), some Caran d'Ache Pablo and Luminance pencils from open stock (ignoring the £:Swiss Franc exchange rate), a couple of Jakar battery erasers (see Product Review: Jakar Battery Operated Eraser Pen) and a KUM Automatic Long Point Pencil Sharpener. I also looked long and hard at purchasing another electric pencil sharpener from Jakar but didn't because of the weight (train/tube etc). Last time I bought I was in the car and this time I was travelling by train. However I was very taken with the offers on paper (but again didn't fancy carrying it home) and the stands by Linda Wain's Procolour, Jakar Caran d'Ache / Gadsby's and Jackson's Art Supplies - which is one you will see at all the art events in the Midlands. Vivien was very taken with an offer on 24 White Light watercolour pans for £5 by Jacksons which she thought was an amazing bargain. The Rosemary & Co Brush stand was also extremely impressive! I think if I'd brought my car and had been at the fair for longer there's a very good chance I'd have gone home with more 'stock'! If you're a visitor: there is enough here to provide a full day out for all amateur/hobby artists. If you're an artist / art teacher: Professional painters might be more interested in the opportunity it presents to sell smaller works and fine art prints and to offer tuition, workshop and painting holidays. Titanium White (soft form) 1.25 fl. oz. Titanium White (original form) 1.25 fl. oz. The charts demonstrate which remain the same and which change - and, if they change whether they have a tendency to go towards orange or yellow. His charts when clicked produce large images and it's very easy to read which paint is which. those which had a distinct lemon yellow tint. This is definitely a RECOMMENDED READ for all painters. Do also make sure you read the comments as they contain interesting discussions about different paints and indicate what he's now planning for the next tests! Have you reviewed an art magazine? It would be a good to develop it by adding in consumer views about the different journals. I want to add in a section for reviews of magazines by artists. So, if you've ever done an online review of a magazine or journal for artists - or read one - and can provide a link, can you please leave a link in a comment to this post so I can add it into my new resource. What's your favourite magazine for artists? There's also a poll this month on Making A Mark - about whether or not people subscribe to magazines for artists and which is their favourite magazine. Click the link, you can find the poll in the right hand column - just below the pics of people who follow the blog. Don't forget to answer both parts!